The Picoseconds Laser is the most popular laser for the removal of pigmented lesions, acne scar, age spots, skin resurfacing and tattoos. 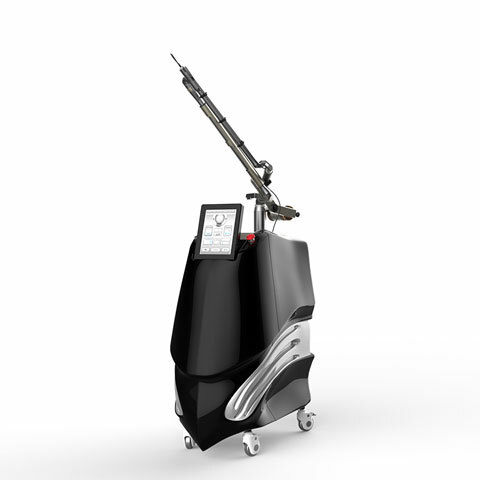 The laser has already made major headway in tattoo removal and is considered to be the fastest and more comfortable way. It is one of the best and safest laser skin treatments for the body which is non-invasive and non-surgical. The Picoseconds Laser technique uses ultra-short pulses that hit the melanin pigment with a great force. As a result, the melanin pigment gets shattered into tiny particles, which get easily absorbed by the body or eliminated. It is most effective and much faster than traditional nanosecond technology. Picosecond lasers are able to get rid of even the most stubborn ink particles within the skin. Consumers can look forward to minimized risk and discomfort throughout the procedure. The high-quality laser source with a variety of wavelengths and adjustable spot size and brightness provide effective and precise treatment. Closed Circuit Water to Air provides effective cooling. Take advantage of the technology and order your product right away. With a groin demand for the Picoseconds Lasers, ensure that you shop only with experienced and reliable manufacturers that promise quality services and products.